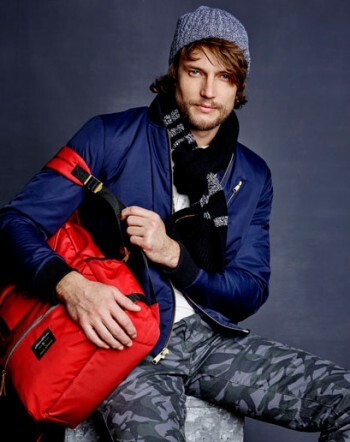 Eddie Bauer has announced its collaboration with celebrity stylist Ilaria Urbinati on a limited-edition 28-piece menswear collection set to debut in the Fall of 2015. The collection fuses modern style and fit with iconic Eddie Bauer heritage to create the ultimate outdoor sportswear line, marked by uncompromising quality, multi-functionality, and performance. Inspiration for the collection started in Eddie Bauer’s vast historical archives where Urbinati researched iconic designs and classic patterns to create tailored pieces that offer unique detailing and a new modern slim fit. The collection include a modern interpretation of Eddie Bauer’s 1936 Skyliner Jacket and 1953 Kara Koram Down Parka as well as fair isle sweaters, buffalo check flannel shirts, and chino pants with a custom-designed camouflage print using the brand’s iconic goose logo. The Nordic color palette features rich crimsons paired with deep navy and hunter green, accented by neutral grays and oatmeal colors. The Eddie Bauer limited-edition collection by Ilaria Urbinati will be available in select North American stores and online in October 2015. The collection will debut at Eddie Bauer’s Adventure House at the 2015 Sundance Film Festival January 23. www.eddiebauer.com.